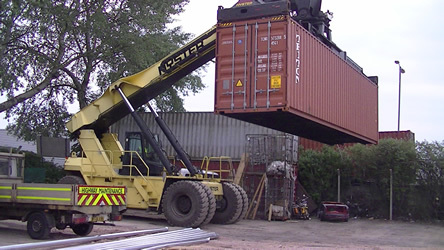 Wright Rain has completed the loading of 4qty 40foot containers with agricultural irrigation equipment for use in large scale crop research. 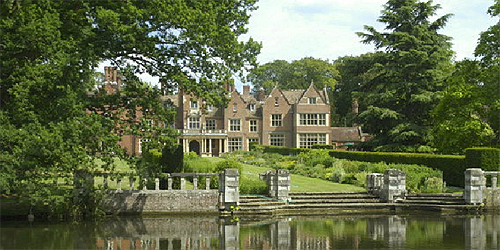 In October 2012 Wright Rain was approached by the owners of Longstowe Hall to install a new irrigation system to water the formal lawn and the adjacent borders. Following a detailed site visit it was decided that to offer the maximum flexibility the areas to be irrigated would be split into 6 individually controlled zones, 1 for each of the two lawns, and 1 for the four borders. With this level of flexibility the south facing borders are able to receive additional irrigation, and the north facing borders to receive the required levels of irrigation. The sprinklers chosen for this project were the Hunter Pop-Up type, with a run of full circle, low-angle sprinklers running down the centre to irrigate the lawn. And a run down both sides with 12” pop-ups set to 180 degrees to irrigate the borders. The use of the 12” pop-up means that the throw of water can reach over the plants to the back of the bed and ensure all areas are effectively covered. 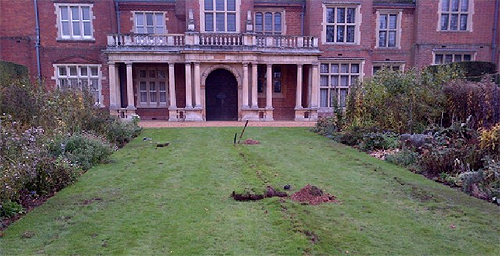 To minimise the disruption to the beautiful lawns & gardens it was decided to use Wright Rains vibrating mole-plow to install the pipework, to reduce the need for open trenching. The photographs show the work in progress during the instillation. On completion the mole routes will be roller-ed and the sprinklers set to the correct level. The open holes are ready for the sprinklers to be fitted. 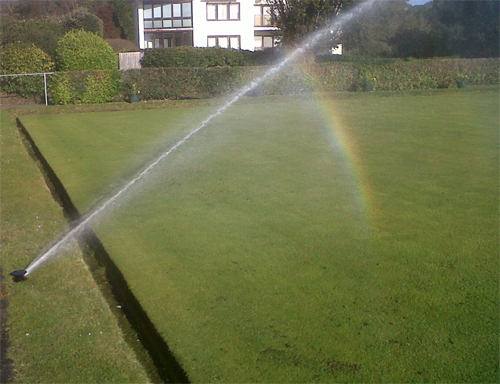 Once the sprinklers are in place the lawns can be left to re-grow ready for the new season. In May 2012 Wright Rain Ltd working with R & K Kensett Ltd and the Sports Turf Research Institute were tasked with re-development of Blackheath Cricket Clubs grounds near the site of the Royal Arsenal, Woolwich, as part of the Olympic regional development. With R & K Kensett carrying out the ground works under direction from the Sports Turf Research Institute it was left to Wright Rain with over 50years experience to supply and install the irrigation system. Following a detailed site visit it was decided that a 7000l (7m3) underground water storage tank would be the most aesthetically pleasing, and work commenced on installing the tank. As this was being carried out the pipe work was installed with the Wright Rain vibrating mole plow, this causes minimal surface disruption and is much more time efficient than open trench work. The sprinklers selected were the Hunter I31 Commercial/Sports Turf pop-up sprinklers, with a throw of around 19m and heavy duty Stainless Steel riser only 4 would be needed. 1 sprinkler was installed in each corner of the cricket square, and with their own control valve a high level of accuracy could be achieved. Ground works are nearly completed. Visible is the tank and some of the historic Grade 1 listed buildings from the Royal Arsenal. Hunter I31 Sprinklers in operation.